The DAX Index rose 0.47% as it recovered some of its losses to end at 11905. On Wednesday, the ECB meeting went as expected in that rates remained steady which is supportive for equity markets while President Draghi’s reiteration of slowing economic growth in the Eurozone isn’t. He cited weak economic activity in light of the persisting uncertainties surrounding global trade and Brexit and a decline in headline inflation in the near-term to which today’s data reaffirmed as German CPI remained steady at 0.4%. Given the recent spark of conflict over tariffs between the EU and US, there isn’t much to fuel risk appetite and gains on the DAX should be limited. 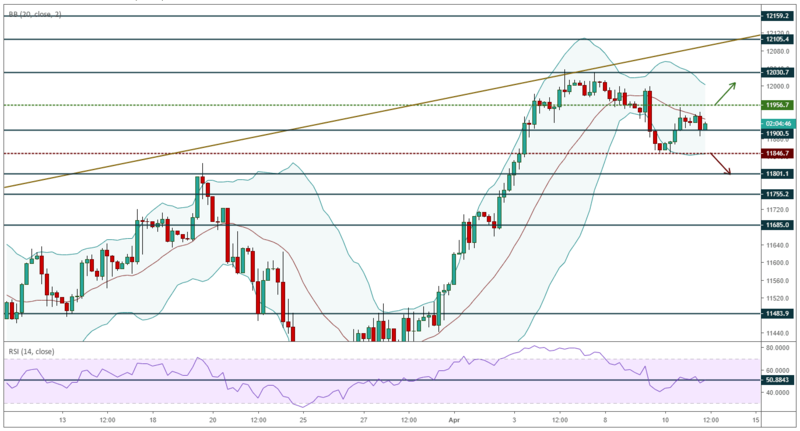 The DAX managed to erase Tuesday’s losses as it bounced off of the support at 11850 however continued to hover below the 20-period MA. The RSI reading is hovering around the 50-midline confirming the short-term neutral bias and price would have to trade above the resistance at 11950 to indicate further advances towards the resistance at 12000/12010. On the other hand sustaining below the 20-period MA should leave the index drifting lower towards near-term support at 11850 with a break through this level required to signal bearish price action.